Duracell Plus 4 x AA (MN1500) + 4 x Free Batteries! 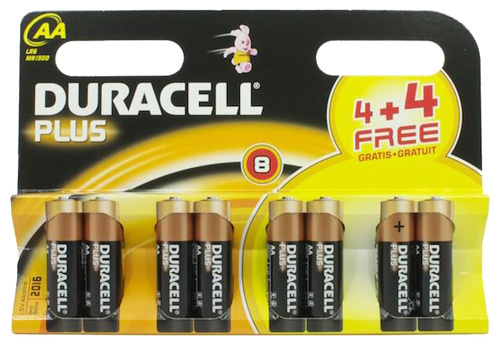 Home > News > Special Offers > Duracell Plus 4 x AA (MN1500) + 4 x Free Batteries! Cell Pack Solutions are pleased to announce that we are currently stocking 4 + 4 Free Duracell Plus AA batteries. You are literally getting twice the amount of batteries for the same price as a standard pack of 4 cells! Duracell Plus lasts and lasts… and lasts! Our number 1 selling battery for everyday use, Duracell Plus: at the heart of your devices for all your power needs. Duracell are the world’s leading manufacturer of high-performance alkaline batteries and a recognized leader in advanced battery technologies including lithium, manganese dioxide and zinc air batteries as well as nickel-metal-hydride rechargeable batteries. Duracell’s products are designed to give you maximum power. Whatever your power needs, it will last longer with Duracell. Buy them here at Cell Pack Solutions for only £2.93 inc VAT!